Meal in a Jar: what size ? A Family Can (#10) can usually holds 11-11.5 cups of product. A Pantry Can (PC) usually holds 3.5 cups of product. 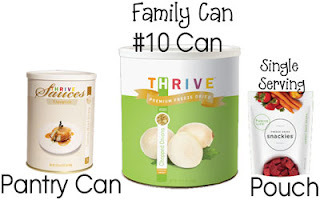 Thrive packages their products according the weight, not volume, so it can be a little tricky to have this be exact. When you see FD in front of a product name, it means Freeze Dried. Different jar sizes for different needs, not everyone eats the same size meal so you will need to adjust for what you need. It’s easy to customize these!